it was worth the trek. 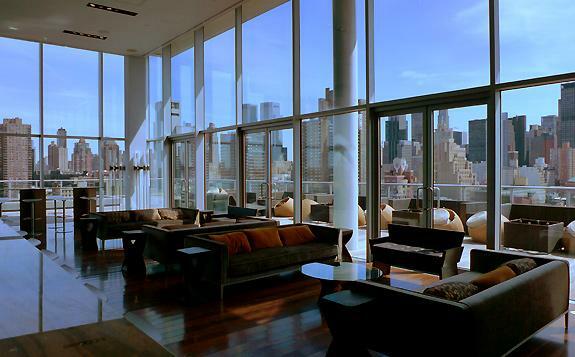 It boasts phenomenal sweeping views of NYC. It is undoubtedly one of the best views of New York from a bar. The inside bar room is enclosed with floor to ceiling glass walls that reveal the view from inside. Outside is a deck that wraps fully around the bar room. The decks focal point is a long illuminated wading pool changing colors throughout the night. Unique oval chairs and tables are scattered throughout but most are standing or sitting on the edge of the pool. Press has an upscale classy ambiance but is not the least bit pretentious. The feel is relaxed and low key. For a rooftop bar, it’s a large space which fills up but never gets over crowded. The crowd tends to fall on the older side but is usually a decent mix. The menu features a few house cocktails which are good not great. Stick with wine, beer or mixed drink. Press is not your late night fist pumping drink till 4AM type venue. Press is your classy cocktails with a few friends or after dinner drinks to impress your date venue… and you need one of those in your arsenal. So make the trek to Midtown Way West and enjoy the view. Great place, went there before i went to Mayahuel……both well worth a visit.